As I leave the Chilean border control I follow a gravel track which becomes progressively worse. Soon I’m driving over river gravel, a thirty foot river to my right. I can see the Argentinean border. What I can’t see is a bridge. There’s a reason which becomes apparent when the track stops by the river and re-emerges at the opposite bank. The thing with hire cars is that they’re infinitely versatile. I know if I get out to check the water I’ll probably end up being cautious. So without hesitation I drive into the river in first gear, I take it steady, revs slightly up so as not to stall in the middle of a channel in no-man’s land. I can’t see the river bed but the car vibrates every cobble through its frame. The water comes to the wheel arches. I don’t stall, stop or get washed sideways. I emerge on the Argentinean side with a slightly cleaner car. The border control appears to be shut. Eventually I find the guards eating lunch in one of the houses. As they lead me to the office they look over to my car, then back at me before shaking my hand. Clearly this crossing attracts trucks and four-wheel drives, not family saloons. As I get close to the world’s most southerly city the mountains part to reveal themselves, jutting through clouds. Crags and ledges offer half-vistas of the scenery. Sometimes the clouds slink into gullies so that only sharply descending arêtes are in view. Soon the night takes all but a hint of them, but stars fill the gaps in the clouds and a faint moon skirts the edge of mountain lines. I sleep in a layby within twenty kilometres of Ushuaia. As I wake I’m greeted by morning light catching the tips of snow streaked mountains. Thinning clouds move along their flanks, my exhalations hold in the cool air. I feel, ‘there is breath in me, where there was no breath before.’ As I sense a moment of deep emotional transcendence I notice a disposable nappy in the road verge. Then the litter appears to be everywhere. Within an hour I’m sitting on a bench facing the Beagle Channel, a jigsaw of sun and rain passing over the far vista. Gulls gently drift by. Boats come and go. Other tourists pass me. They capture the scene on iPhones and iPads. Then two joggers, their arms moving too vigorously for their pace, head East towards a naval base, a cool wind stretches the flags. After a while observing this place and not before buying a mocha in a seafront hotel I take a boat trip. Three hours on the sea named after Fitzroy and Darwin’s ship. I wished I could take a ship and head even further. The vast ice continent of Antarctica is just a few days away and acts as a compelling reason to continue, the state of my wallet offers a more compelling reason to push such ideas aside. The boat attracts several nationalities, French, Spanish, British, Danish, Argentinean and Chilean. For a few hours we become the tourist equivalent of a Foreign Legion. As we leave the wharf the Martial Mountain range to the north of Ushuaia is punctuated by a vivid rainbow. Our guide speaks Spanish and English. I try to make out what he says before I hear his translation. I’m alarmingly wrong each time. He tells us we’re heading to the islands where sea lions bask and then we’ll make a stop on a larger island where the original people of this land settled. Long before the western colonists arrived they were making a living here. We reach the island with the Les Eclaireurs Lighthouse that’s been confused by many as the ‘Lighthouse at the End of the World’ written by Jules Verne. It’s a fascinating place to be. 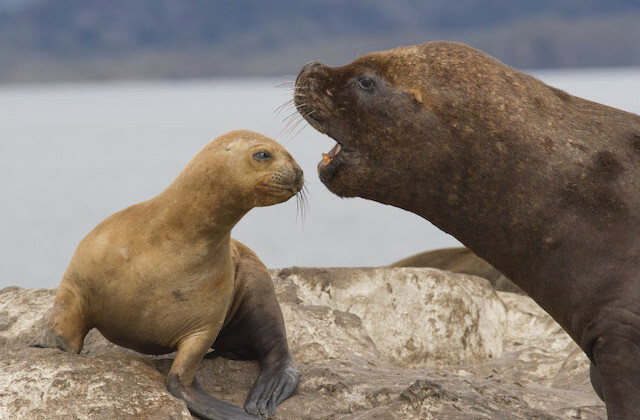 Male sea lions outweigh the females by a vast amount of blubber. Steamer ducks, their tiny wings beating like an old Mississippi steam boat. There are shags and terns and skuas and waders at every turn. This is living; we should all see such things. As we depart from the island’s vicinity a large aggregation of birds draws the captain’s attention. I can see South American terns wheeling and diving. Giant petrels are landing on the surface. Kelp and dolphin gulls add to the mix. As we close in I notice magellenic penguins, shags and black browed albatross too. Groups of terns hover before taking an un-choreographed mass dive. Some rise back with small fish in their bills. Shags and penguins dive from the surface. The activity is frenetic; it’s hard to know where to look. The sound of my camera adds to the symphony of shutters tripping. Before this week I hadn’t seen any of these species. Then we leave the group as the activity wanes. A few hundred metres further, resting black browed albatross are harassed by our boat. They rise and run along the sea till their wings catch enough down force to begin a graceful flight. Those that keep their cool are further harassed as the captain turns to take another glide at them. Then he does it again until they all take to the air. I’d hoped for better than this. Watching albatrosses take off is a wonderful sight but I’d rather just watch and hope rather than barrack them into it. As we move on only a Danish lady and I remain on the open deck. She tells me she’s just retired and is taking the chance to travel. This was her sixth week in South America. As we watch skuas pass with menacing purpose we are both in our element. We talk for an hour, exchanging tales of the places we’ve seen. She’s just arrived from Iguaçu Falls and Torres del Paines. There’s a soft charm to her that melds well with the sea and the cloud draped mountains. Later, I speak to a young woman who studies international relations and development. She’s visiting friends who are carrying out their doctoral studies here. ‘Is that what you’re doing?’ I ask. ‘No,’ she tells me, ‘I’m only 24.’ I know when the ice is thinning. ‘In Britain,’ I suggest, ‘you can have a degree at 21 and a PhD by 24. Is it not the same here?’ She says her first degrees takes 6 years. You must really know your subject by then I offer. ‘Yes’ she agrees her smile giving out much needed warmth. David Higgins is a scientist and conservationist working for the government of St Helena. He also spends time visiting other islands in the South Atlantic.